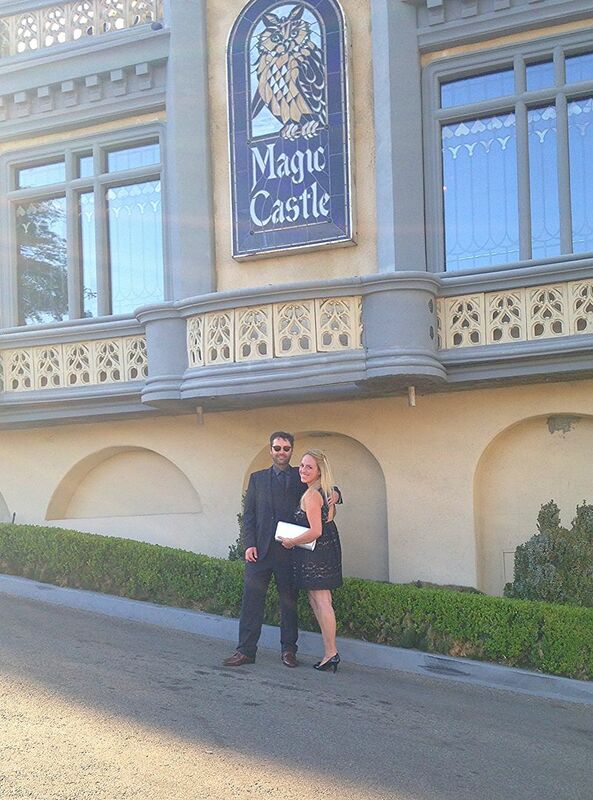 A couple of years ago, two of our friends told us about their amazing visit to The Magic Castle in Los Angeles. At the the time, their mention of the Castle was like a record screeching: the Magic what!? 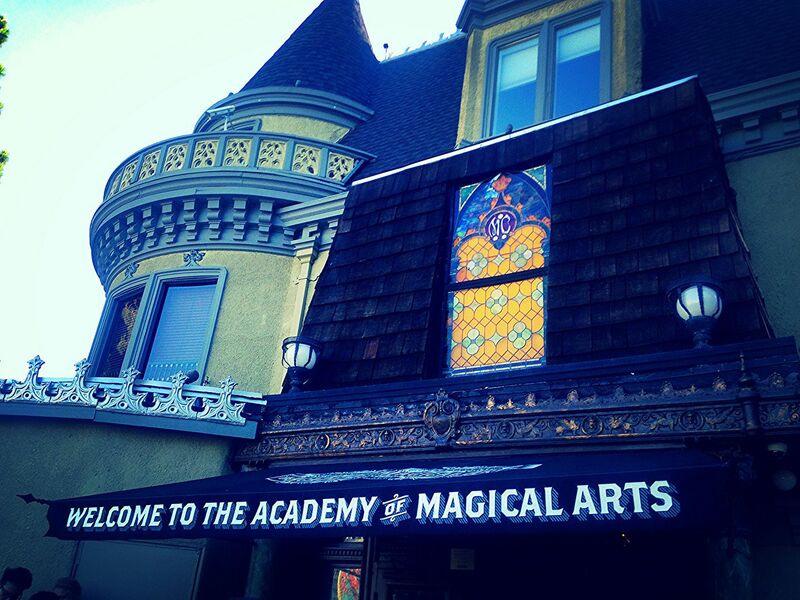 I had never heard of the Castle, but they explained that it's the private clubhouse for over 5,000 magicians who are a part of the Academy of Magical Arts. It's where they take master classes to learn new effects, practice their magic informally in front of guests at the bar, and attend lectures. There was only one problem: it's invitation only. This, obviously, only made me very determined to get in. 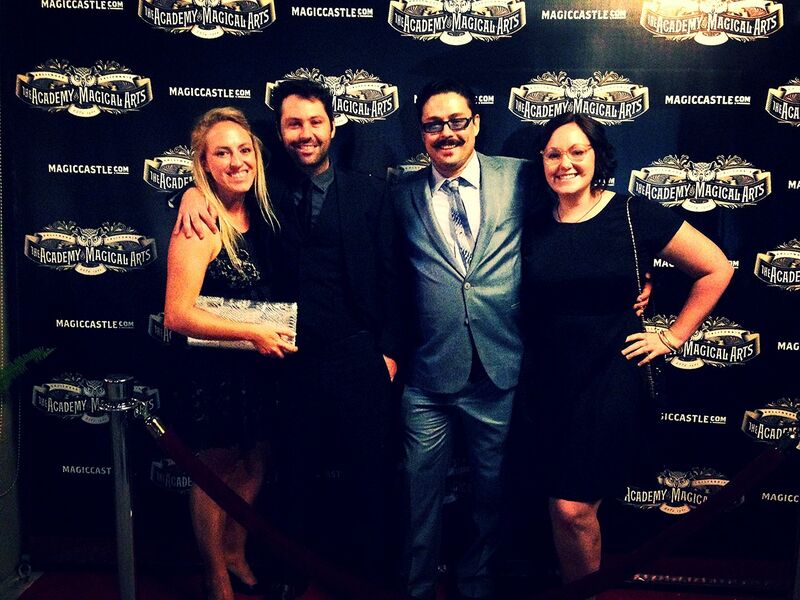 I added a visit to The Magic Castle to my 30 Before 30 bucket list earlier this year and spent the following months trying to score an invite. 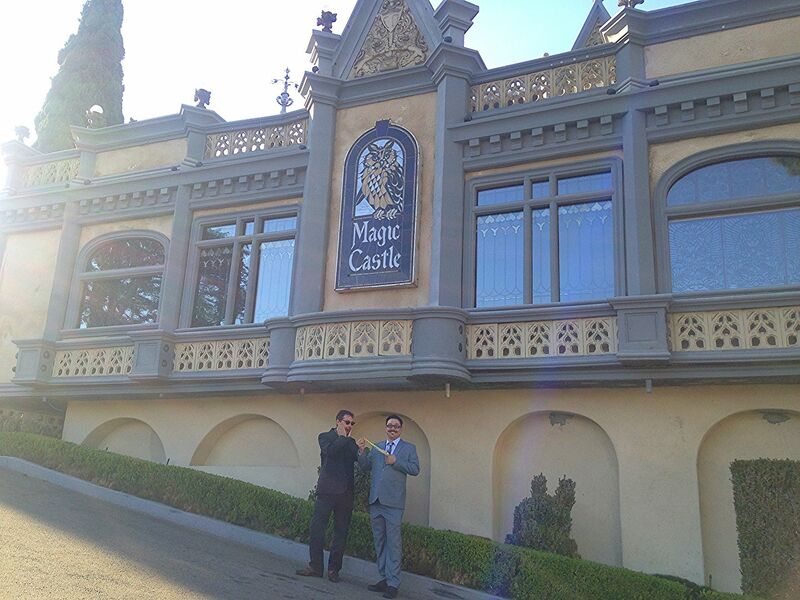 I'm sure if you live in LA and know people who know people, it's infinitely easier, but for me, getting into The Magic Castle required some work. I followed everyone who hashtagged or geotagged the Castle on Twitter and Instagram, in hopes that they would share their methods. 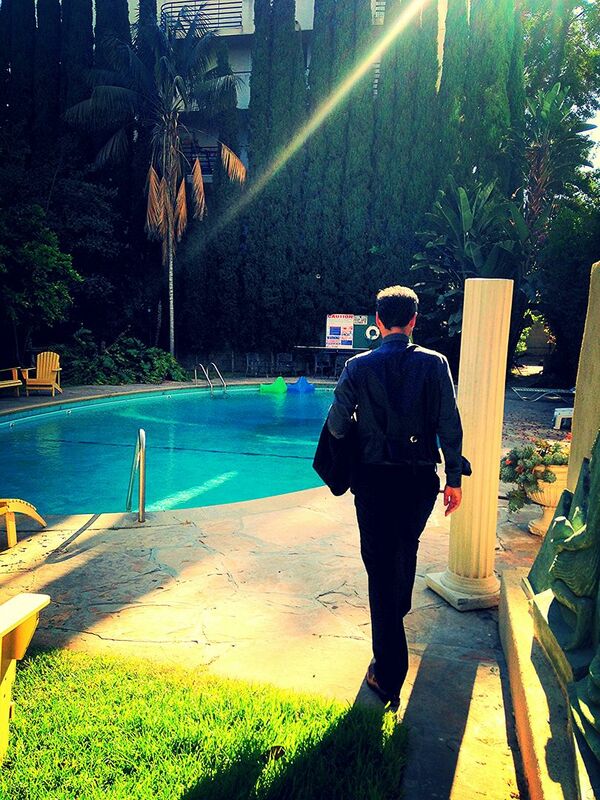 I followed dozens of magicians who lived in LA. And then I started getting smarter about my strategies. 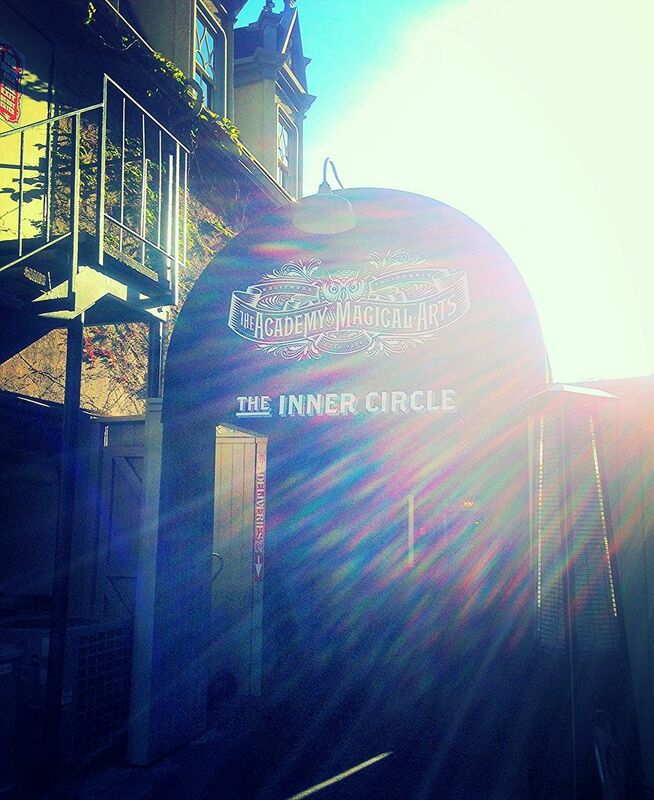 The Magic Castle posts their roster of magicians six weeks out. Each of those performers are allotted guest passes, so I started to reach out to various magicians on Twitter and mention that I'd love to see them perform. When it turned out that magicians aren't necessarily super into their social media accounts. I decided that I needed to take it a step further. I started watching videos of magicians that were on the upcoming schedule and when I found one that I was really wowed by, I sent them an email mentioning specific things about their performance that I was impressed with. 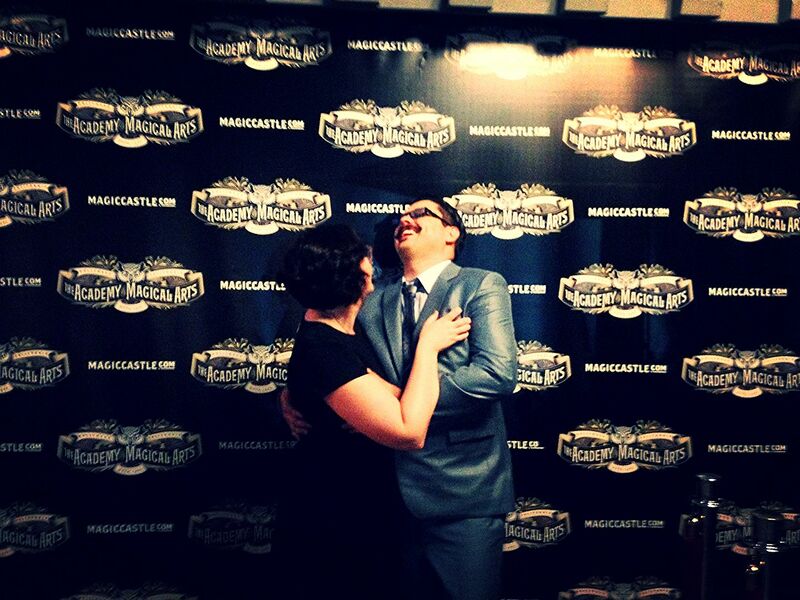 And then I played dumb and asked them where I could buy tickets to their upcoming show at the Magic Castle. When one of them finally responded, he emailed me a guest pass that was good for me and five guests, and sent me his set times as well. We were in! Reservations for Friday and Saturday night book up really far in advance (4-6 weeks), so book as soon as you can to get the time slot you want. I had originally been aiming for the earliest dinner seating so that we wouldn't have to scramble to make it into some of the bigger shows at night, but by the time I reserved a table the only seating for four people was at 9:45pm. 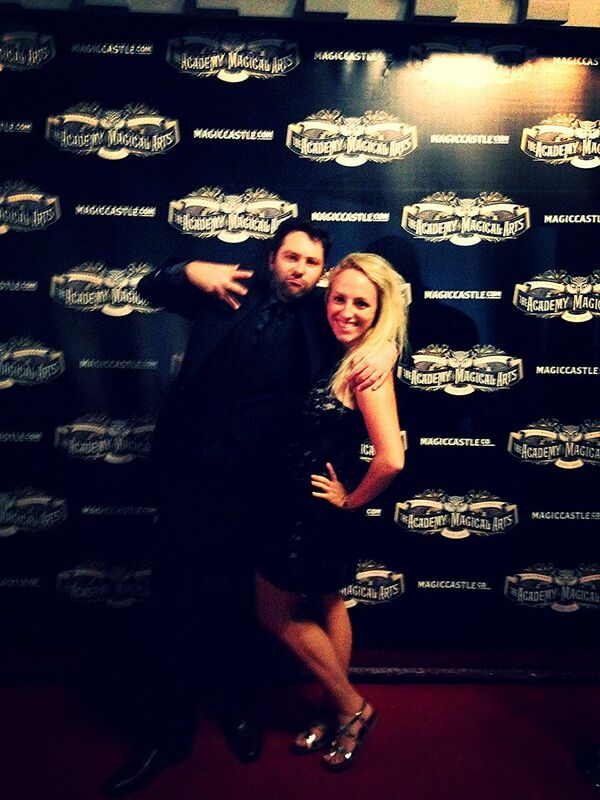 Once we had our night at the Castle booked, I went about planning a whole Hollywood weekend around it. 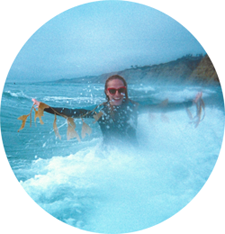 First, I looked high and low for an AirBnB in Hollywood and eventually stumbled onto the perfect one. It was a beautiful building called The Fontenoy and was so incredibly central to everything we had planned that weekend. Supposedly actors like Johnny Depp and Nicholas Cage are among some of the former tenants. And most importantly, it had a parking spot. 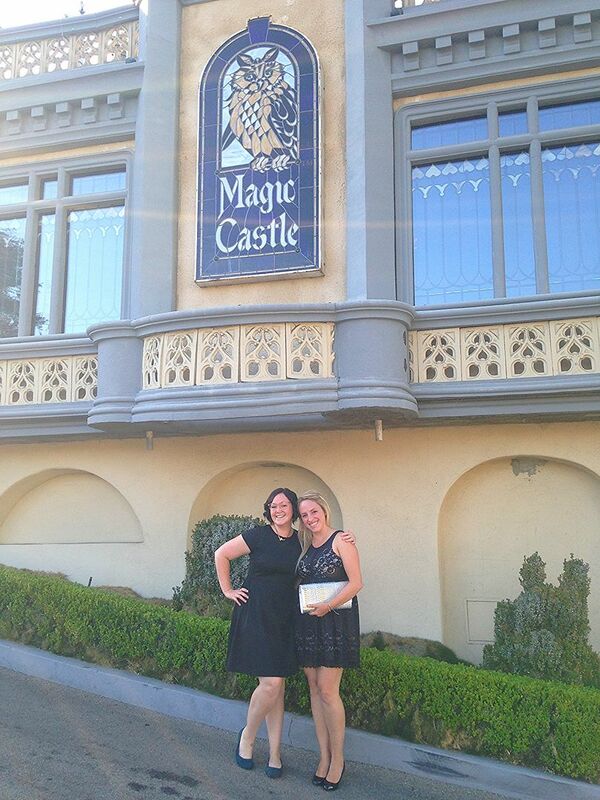 We made the long 4-hour drive up to Los Angeles on a Friday afternoon, checked into our AirBnB, got glammed up (The Magic Castle has a strict formal dress code! 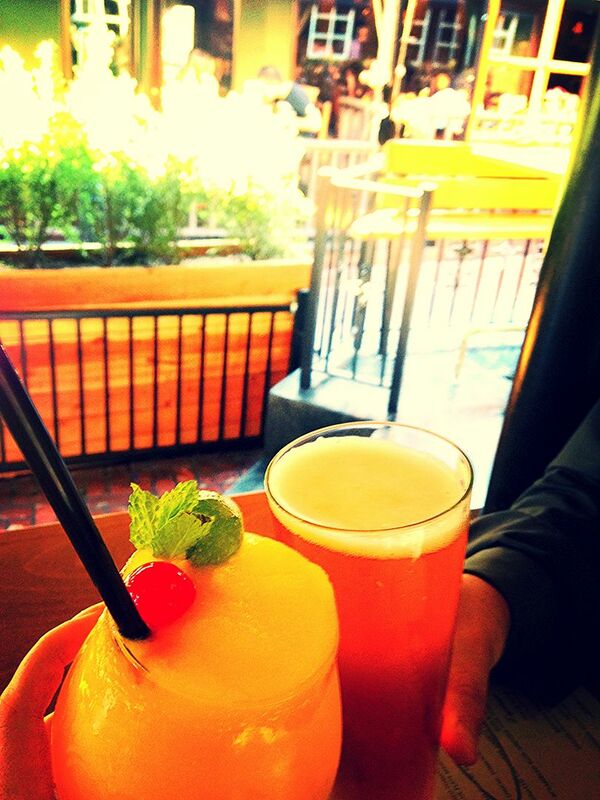 ), and headed down to the street for a drink. A bar called Royal was around the corner and we kicked off our night with a brew and a frozen mango margarita before taking an Uber over to the Castle. Had I known just how close we were to the Castle, I would have suggested we skip the Uber and walk over. Others had mentioned that the Castle was on top of a steep hill, but really it was only a steepish driveway that led to the entrance. The Castle itself is a giant mansion in plain sight, totally visible from the street. Our Uber pulled up into the dropoff zone where we met our friends Bonnie and Jason who were relaxing on the smoking patio near that entrance. 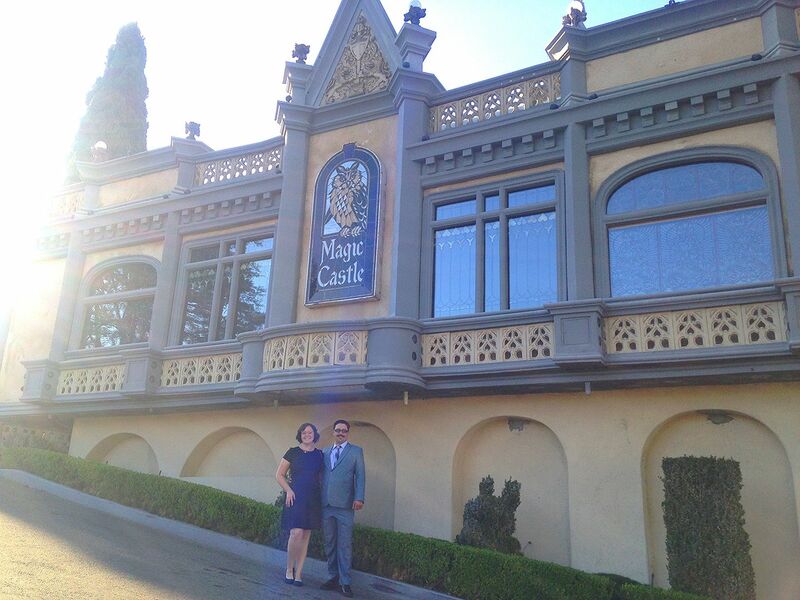 Because there is a strict "no photos allowed" rule inside the Castle, we took a few pictures all fancied up outside in front, then headed into the club's entrance. Once inside, we were in a small room that was decorated like a library. We checked in with the hostess and paid our entrance fee ($30pp on weekend nights), grabbed our programs for the night and then said the not-so-secret password "Open Sesame!" to the owl on the wall so that a door disguised as a bookshelf could slide open for us. The hallway from the front lobby led us to The Grand Salon, an open area with a bar, restrooms, a stairwell, a sitting area where a close-up magician was practicing his magic on guests, and an area to line up for the Close Up Gallery, where our first show of the evening was. Luckily, there was no line, so we grabbed drinks at the bar and managed to grab the last four seats in the 18-person theater. The Close Up Gallery is awesome and the seats are so, so comfortable. There we saw Rich Crowley, a magician who originally hailed from Philly, perform some pretty solid card tricks over the course of a brief, 15-minute show. Rich was very entertaining, and I would later realize that pretty much every magician at the Castle is a fantastic comedian as well. After the show, I asked the bartender how I could get someone to give us a tour of the Castle. I'd read that this was an option that wasn't often mentioned, and I definitely wanted to take advantage of it. The bartender found a Castle Knight, Carlo Panno, for us and we set off on an awesome tour of the Castle with him. He pointed out the piano-playing ghost, Irma, who plays almost any song requested out loud near her, showed us the Museum room where some of Houdini's magic props were housed in glass (though the magicians don't know or don't say which ones are his), and pointed out one of Johnny Carson's old backdrops that sits behind The Owl Bar. He told us that Neil Patrick Harris had been a member of the Castle since his Dougie Howser days before he became President of the Academy for two years in 2013. He also showed us a letter from Cary Grant lauding the Castle for the great time he'd had there and requesting tickets well in advance for an upcoming event. We went downstairs to the W.C. Fields bar inside the Inner Circle Ballroom and saw the Library, which has one of the most extensive collections of magic tricks in the world. Overall, it was a fantastic tour, and we got some great insider tips on the lineup from our Knight. For one, he insisted we not miss Brian Gillis, a close up magician and mentalist who was about to perform at the W.C. Fields bar in a few minutes. So we sidled into four seats around the performance mat and ordered drinks, including a round of NPH's, Manhattans named after Dougie himself. Then my mind got blown. I mean just... blown. Brian performed for just the four of us at first and was essentially no more than one foot away the whole time. This is important because we had NO idea how he was making these tricks happen. I don't want to give away his set because it's my hope that this will encourage you to see himself yourself, but let's just say I cried and dropped a lot of F-bombs because I was just so, so shocked and awed by all of his tricks. It's no wonder that he's known as Johnny Carson's favorite magician. After Brian's performance we went to see two acts perform back-to-back in the Peller Theater, a ventriloquist named Rob Watkins with his dummy Eucalyptus, and a banjo-playing magician named El Ropo who performed a series of rope tricks. Then we went upstairs to grab a seat at the table of another magician recommended by our Knight, a card magician named Bill Joslin who was performing informally right next to The Upstairs Bar for tables of about 8 guests at a time. Again... mind blown. Without realizing where the past 3.5 hours had gone, it was time for dinner. I'd read mixed Yelp reviews about the food at the Castle, mostly from bitter people who felt overcharged. But our meals were absolutely delicious, as was the wine Jason selected. I ordered the Garden Risotto and Ryan got the Jidori Chicken and we were both very happy with our selections. Ordering entrees also got us guaranteed entry into the biggest show of the night, the Palace of Mystery. When we were done with our meals, we headed down there to get a good seat and ordered our drinks for the show from a cocktail waitress. To be honest, by this point, I was getting a bit tired and hazy so I don't remember too much from the show, but we watched a fantastic mime and juggler, Lindsay Benner, perform her one-woman show before two illusionists took the stage. 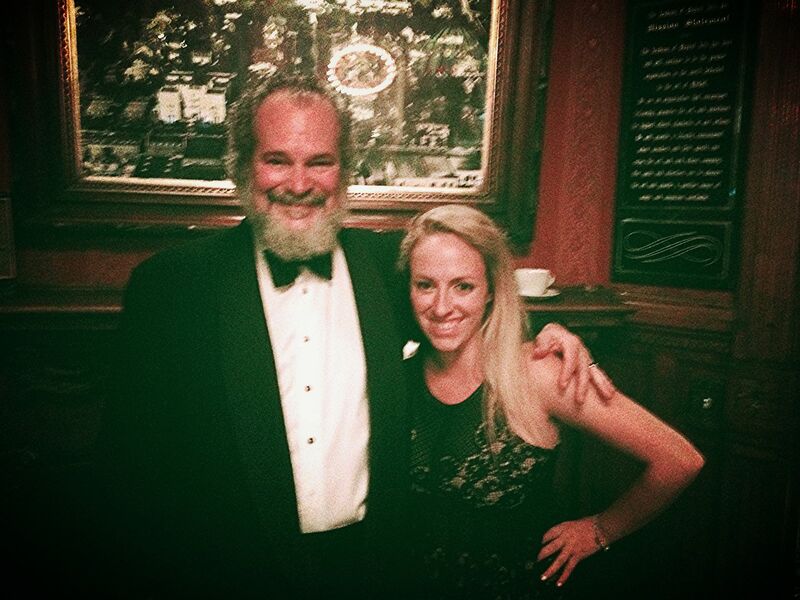 Finally, it was time for the very last show of the night, the magician we were invited by, Johnny Ace Palmer, performing in the Parlour of Prestidigitation. Johnny is a fantastic magician and he closed the evening for us by pulling an actual rabbit out of a hat... the perfect way to end a night at the Castle. I made sure to rush up to him after and thank him for inviting us and managed to get a rare picture inside the Castle with him! Spilling out into the night with the rest of the crowd from the Parlour we decided to ham it up a bit more in front of the Step-And-Repeat screen outside of the entrance... as you can see we had dissolved into a giggly mess after seven hours of non-stop magic and drinks. 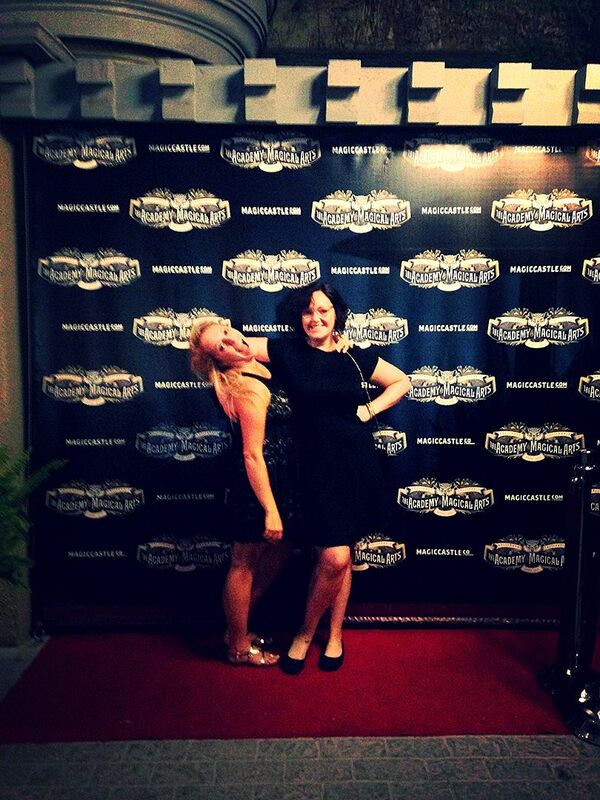 My first time at The Magic Castle was nothing short of perfection... maybe one of my favorite nights ever. I had an amazing time and am just still so in awe of the magicians we saw, the food, and the building itself. Even though it is an expensive night out, you definitely get your money's worth if you do it right. Don't miss out on getting a tour from a Knight, because aside from all of the performances that was a major highlight for me! 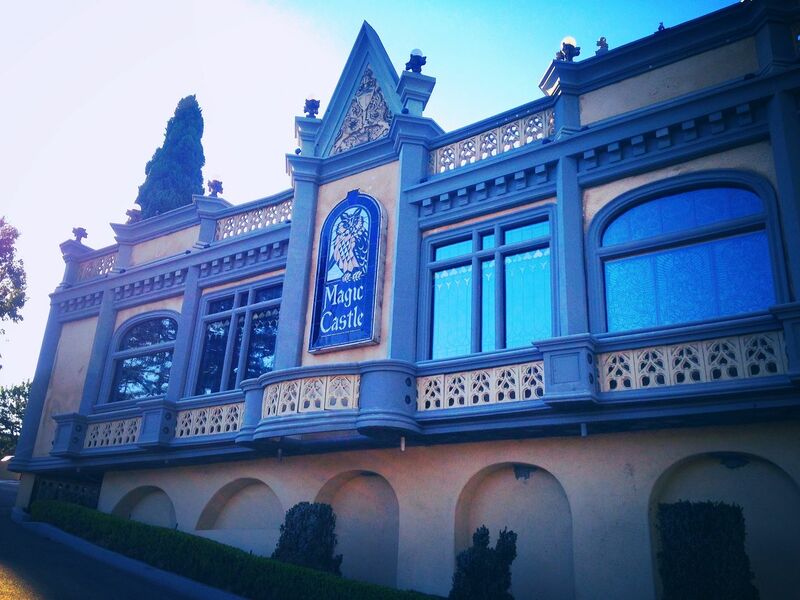 So if you haven't already, make The Magic Castle a must-do on your Los Angeles bucket list, suspend your disbelief for a night and settle in for some libations, glamour and of course... magic. I loved everything about this post and now I'm more determined than ever to get an invite as well! 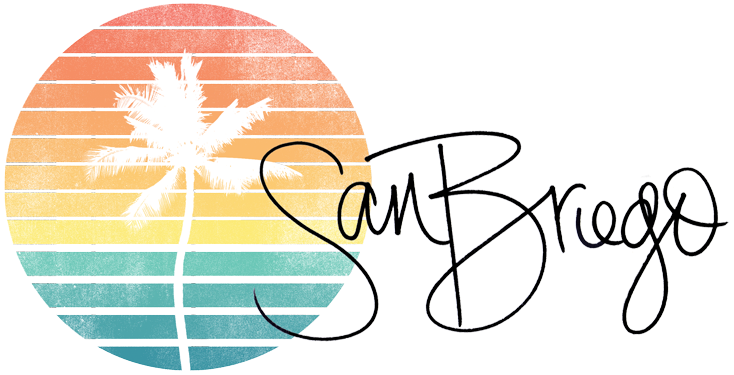 :-) We visit Southern California once a month and this would make a great adventure for my travel blog! Thanks for the inspiration! I've been emailing magicians for over a year and still wishing to gain entry before my son moves out of Hollywood in May. Thank you for sharing your magic experience!